"Best Of Customer Service on Houzz 2016"
TRAX Ceiling Shower Rod.com, a division of TRAX, is a family owned and operated California company founded in 2003. We bring together our unique skills to create home decorating solutions that are both beautiful and functional. Our objective is to help our clients achieve the designer look they desire at an affordable cost. 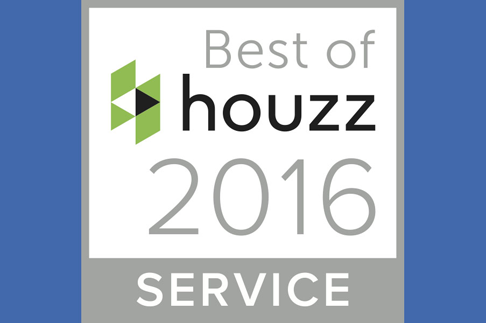 TRAX of El Dorado Hills has won “Best Of Customer Service on Houzz®", the leading platform for home remodeling and design. “The bathroom decorating products manufacturer” was chosen by the more than 35 million monthly unique users that comprise the Houzz community from among more than one million active home building, remodeling and design industry professionals. Peggy, our designer, is a graduate of the University of California at Davis where she majored in design. Peggy's specialties include innovative use of fabrics and coordination of color. The use of ceiling mounted tracks to use for shower rods was Peggy's idea when looking for a solution for a shower rod for her tub. For her neo-angle tub she wanted the shower curtain to slide easily around both corners and she wanted to move the shower rod and ceiling suspensions out of eye level view. Steve is TRAX's engineer with the task of designing products that are functional and easy to install by the homeowner. Steve is an engineering graduate of Northwestern University and the University of Minnesota and has 25+ years experience in home products design and safety. If you have questions on custom track design, product installation, and other uses of TRAX, give Steve a call. John is in charge of packaging and shipping. He takes great care in packaging our customer's products and makes sure they are shipped out on time. He also helps with TRAX rod production. 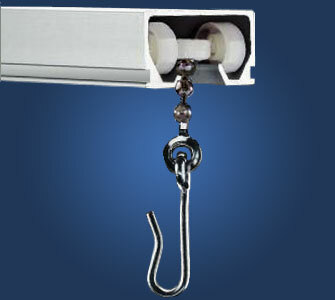 He has many years of experience in shipping, manufacturing, and warehouse activities. Jennifer is responsible for TRAX's customer service and office management. Her primary concern is customer satisfaction. She has a business degree from Cal Poly in San Luis Obispo and has several years of experience training customer service representatives as well as experience working in human resources management. We are proud of our products and it is her goal to create a pleasant experience for everyone who is interested in what TRAX has to offer.